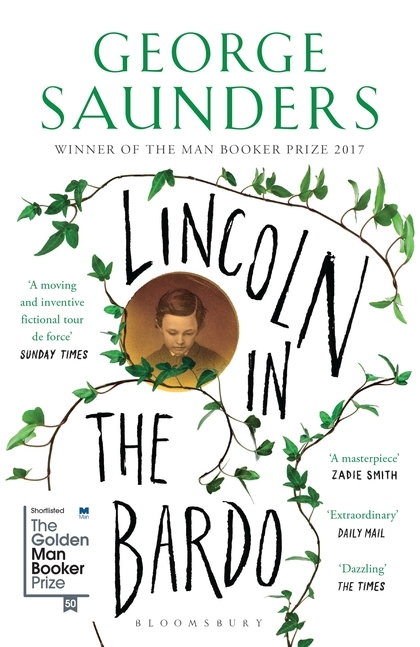 I had been slightly resistant to reading George Saunders' Booker Prize-winning Lincoln In The Bardo, because I'd seen quite a lot of slightly smug comments about it on social media in which people said 'Of course, it's challenging - but so rewarding' as if reading an experimental novel is somehow like getting your Duke of Edinburgh Gold Award or volunteering in Chad, and everyone should congratulate you for it. And also, while I've no problem with novels that experiment with form, I don't think it should come at the expense of plot and character. Fortunately, though, Lincoln In The Bardo is really not a particularly difficult read. It's told through the voices of over 100 characters, who will sometimes speak for several pages, sometimes only for a few words. Sometimes sentences are split between two characters, with one breaking off halfway through to handover to another. However, the characters with the most to say are so immediately engaging that the unusual way in which the narrative is constructed very soon starts to feel perfectly natural. The story is set during the American Civil War and deals with the death at the White House of Abraham Lincoln's 11-year-old son, Willie, while his parents host an extravagant party downstairs. Distraught, Lincoln visits the cemetery crypt alone at night to visit his son's body. Unbeknownst to him, the cemetery is inhabited by spirits trapped in the 'bardo', which appears to be akin to some sort of limbo between this world and the next and from which they are reluctant or unable to move on due to a sort of denial that they are dead at all. Coffins to them are only 'sick-boxes' and dead bodies are 'sick-forms', while the spirits themselves take on bizarre and grotesque appearances that the living cannot see. Concerned for poor Willie Lincoln and fearing that he too will be trapped in the bardo - a terrible fate for a child - if his father can't achieve some sort of closure and let him go, the spirits take it upon themselves to help Lincoln come to terms with Willie's death and therefore to help Willie's soul move on and find peace. Interspersed with all this are the personal testimonies of the spirits themselves and brief digressions in which they talk about their own lives and experiences. Our primary narrators are Vollman, a printer killed in a workplace accident before he could finally consummate his marriage to his much younger wife; Bevins, a gay man who took his own life after being rejected by his lover; and the Reverend Everly Thomas, who is convinced he will be damned if he leaves the bardo but can't - for reasons unclear - articulate why. Vollman and Bevins are a charming double act, while the Reverend is an altogether more ambiguous but fascinating figure, and the myriad voices of the other spirits add many extra layers of perspective and historical detail to the story - soldiers, slaves, paupers, society beauties, they're all here. Also scattered through the story are short extracts from biographies, eyewitness accounts, letters and histories of Lincoln, some real, some created by Saunders. Some are enlightening, some contradictory, some judgmental (sometimes heartbreakingly so) and I felt they also provided a break from the intensity of the voices of the spirits and gave the story some grounding beyond the supernatural realm of the main narrative. What you won't get from this book, though, is much detail about Lincoln himself; this isn't a biographical novel at all and Lincoln as a character is actually a peripheral one. Dealing as it does with the death of a child, a grieving father and some characters with some deeply troubled backgrounds, Lincoln In The Bardo is sometimes deeply sad, although never sentimental. But it's also far more funny than you might expect, and some of the most touching moments don't involve Lincoln and Willie at all. This is an unusual novel, and it certainly won't be to everyone's taste - reader reviews on Amazon and Goodreads are very much divided regarding the style and structure - but it is absolutely not the challenging slog some have suggested it to be. In fact, it's a simple story, but cleverly and unusually told, and the realm of the bardo and its inhabitants are so vividly rendered, the voices of each character so personal and immediate, that I found this an immersive and genuinely gripping read.